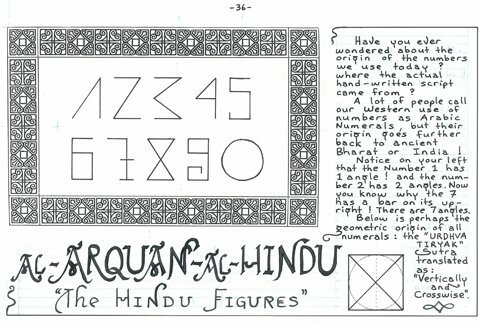 Here is a rare compilation of ingenious Mental Mathematical Short-Cuts based on some of the 16 Vedic Sutras that involve the Number 9. A special tribute is paid to the Indian Master Bharati Krsna Tirthaji (1884-1960). One important Sutra is: “All From 9 & The Last From 10”. Jain believes that if we persist to use electronic calculators for the next 20 years, the global brain will atrophy. 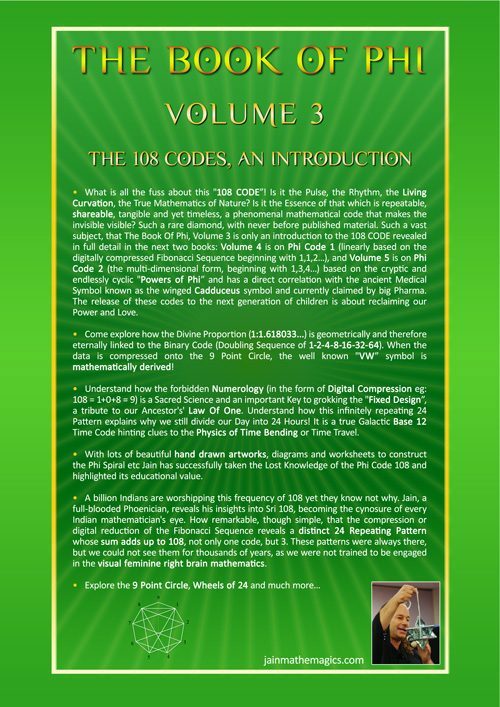 Base 9 is Galactic Mathematics, and is the hidden engine that permits Rapid Mental Calculation to transform you into a Human Bio-Calculator. 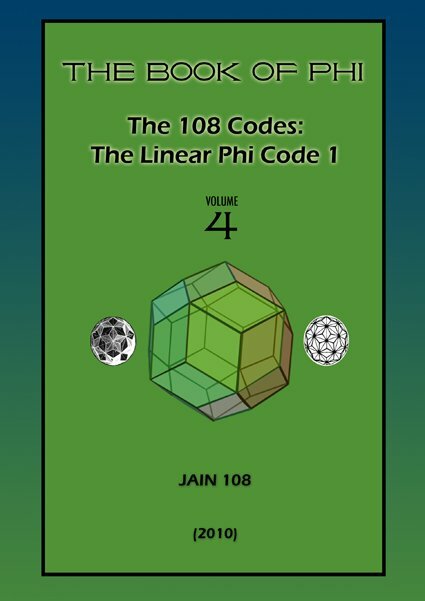 It is the “Complements of 9” that cracks the Fibonacci Sequence (1-1-2-3-5-8-13-21-34) and reveals the precious 108 Phi Code Pattern of 24 infinitely repeating numbers. 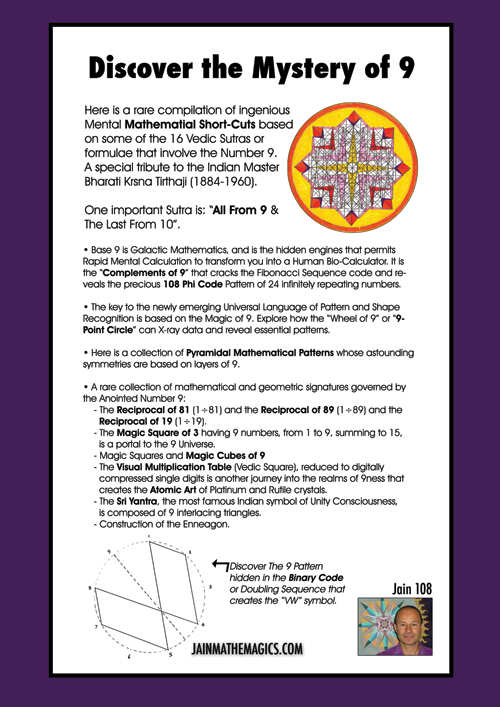 The key to the newly emerging Universal Language of Pattern and Shape Recognition is based on the Magic of 9. 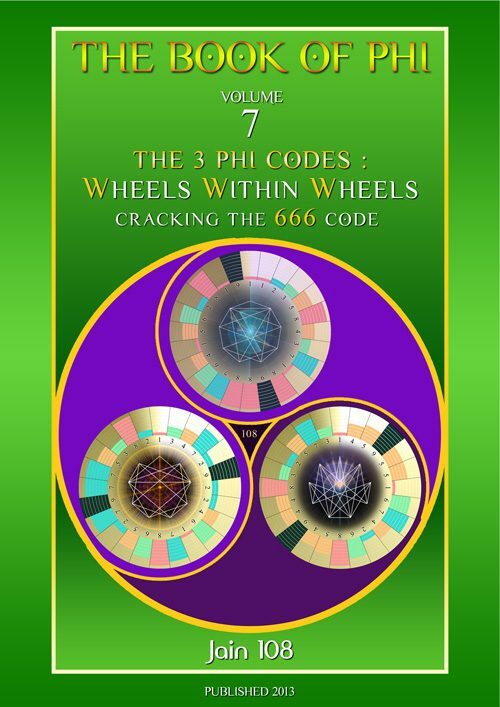 Explore how the “Wheel of 9” or “9-Point Circle” can X-Ray data and reveal essential patterns. 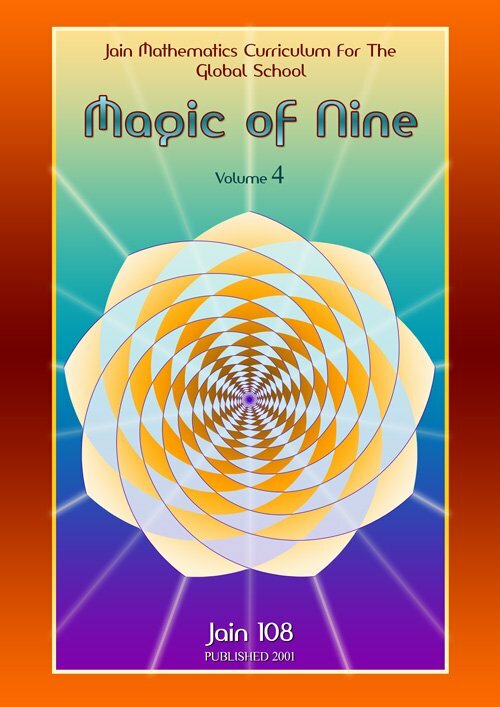 Originally known as “The Magic Of Nine In Vedic Mathematics” it goes beyond the Vedas, and belongs to Universal Knowledge. 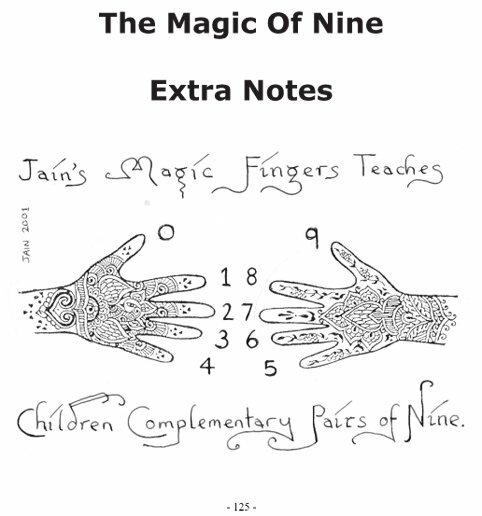 This is Jain’s lifetime collection of interesting information regarding the mystical number 9, enhancing the student’s love for numbers. 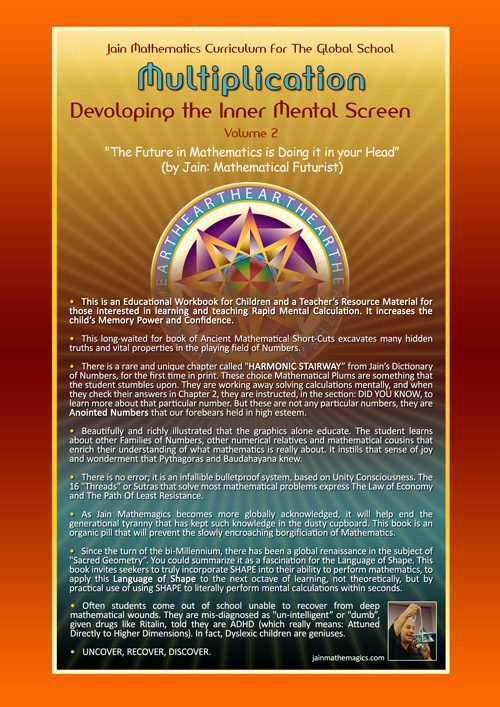 A highly intelligent and sophisticated system of Intuitive or Clairvoyant Mathematics. This book is inspired by Shankacharaya of Puri a.k.a. 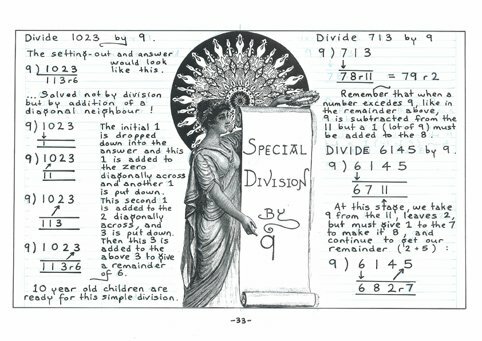 Bharati Krsna Tirthaji’s (1884-1960) now famous book ‘Vedic Mathematics’. This book has spawned a 1,000 websites! Shankacharaya was invited to America by Paramahansa Yogananda on a world tour spreading the ancient message of Vedic Mathematics. Shankacharaya’s chief and current disciple is Maharishi Mahesh Yogi of Transcendental Meditation fame. Maharishi’s spiritual school is churning out child geniuses like the ‘Rain Man’. The Art of Mental Calculation is an important way of exercising the Brain’s ‘Mental Muscle’. In contrast to the left-brain-logical-male method of rote-learning we learnt at school, this system uses the right-brain-female style of Pattern Recognition. Its purpose is to make it known that we are far more superior than any calculator. Jain believes that if we persist to use calculators for the next 20 years, the global brain will atrophy. This book has a list of the 16 Vedic Sutras and explains some of them. This book evolved as a series of lecture notes. 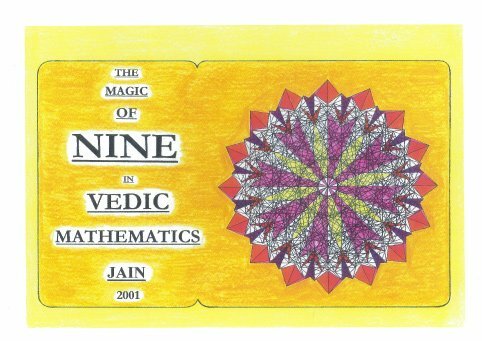 Over the year whilst I was first demonstrating the definition of Vedic Mathematics as a Mental and One-Line Arithmetical System of 16 Sutras, people in the audience were too busy scribbling the examples down and therefore not paying full attention, so I decided to put most of the lecture examples and extra notes into this book. 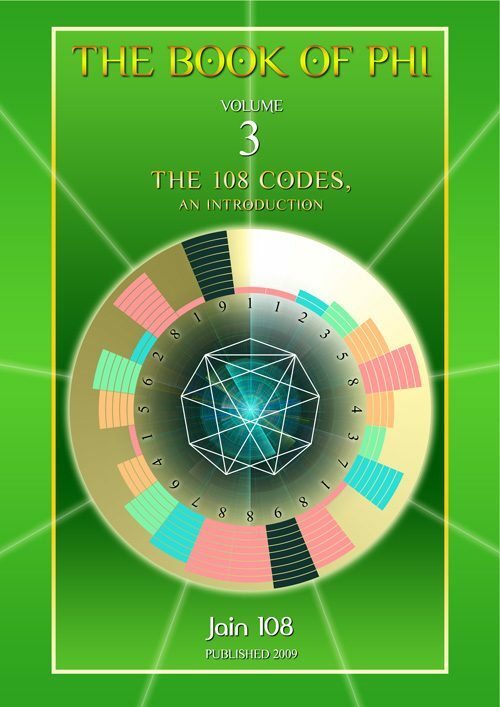 Here is a collection of Pyramidal Mathematical Patterns whose astounding symmetries are based on layers of 9. — The Reciprocal of 81 (1÷81) and the Reciprocal of 89 (1÷89) and the Reciprocal of 19 (1÷19). 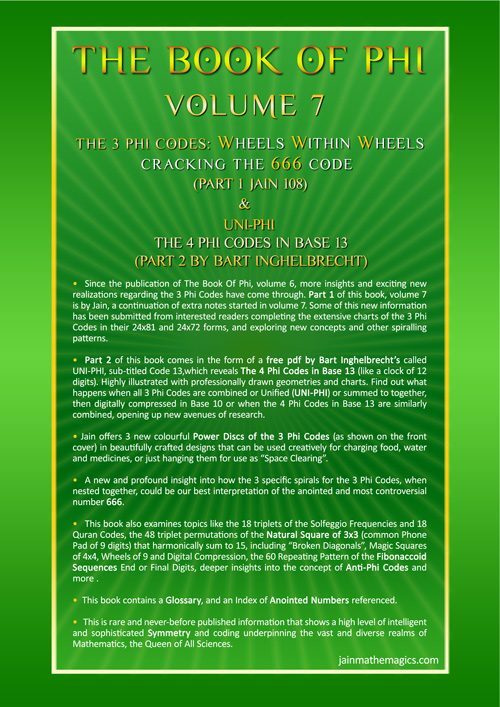 — The Magic Square of 3 having 9 numbers, from 1 to 9, summing to 15, is a portal to the 9 Universe. 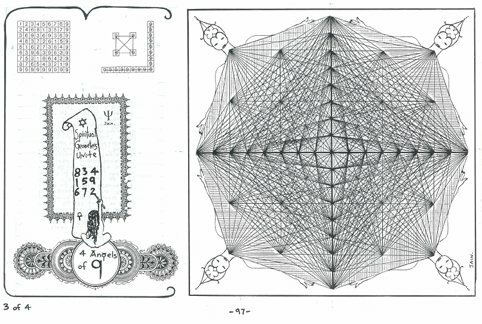 — The Visual Multiplication Table aka Vedic Square, reduced to digitally compressed single digits is another journey into the realms of 9ness that creates the Atomic Art of Platinum and Rutile crystals. — The Sri Yantra, the most famous Indian symbol of Unity Consciousness, is composed of 9 interlacing triangles. 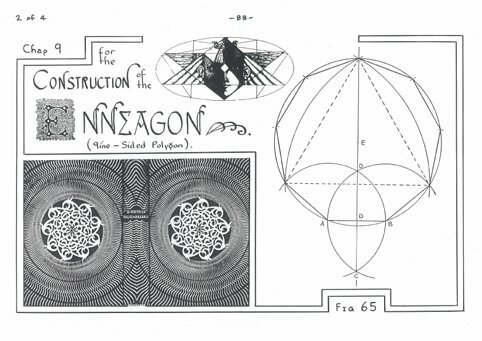 — Construction of the Enneagon. —The 9 Pattern hidden in the Binary or Doubling Sequence (1-2-4-8-16-32-64) that creates the “VW” symbol. 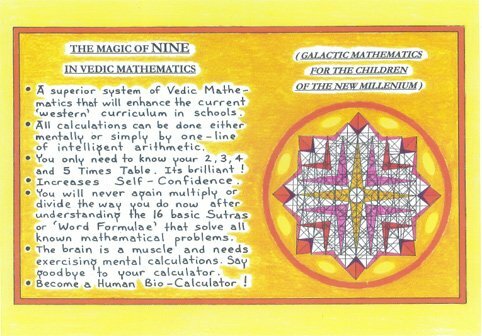 A superior system of Vedic Mathematics that will enhance the current “western Curriculum” in Schools. All calculations can be done either mentally or simply by one-line of intelligent arithmetic. You only need to know your 2, 3, 4 and 5 Times Table. Its brilliant! 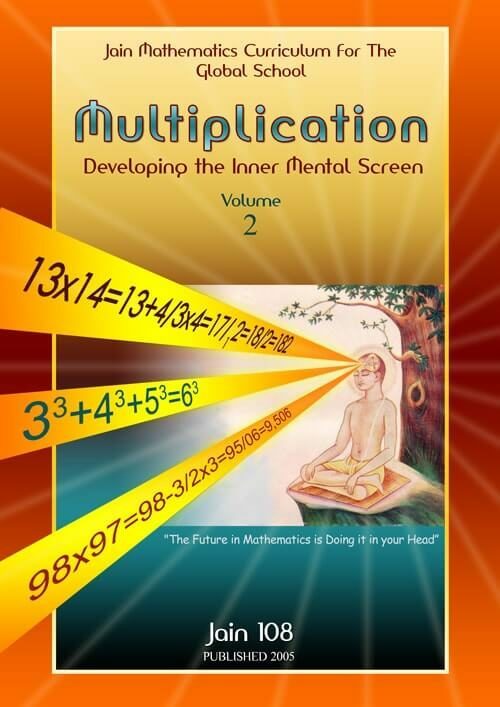 You will never again multiply or divide the way you do now after understanding the 16 basic Sutras or “Word Formulae” that solve all known mathematical problems. The brain is a muscle and needs exercising mental calculations. Say goodbye to your calculator. 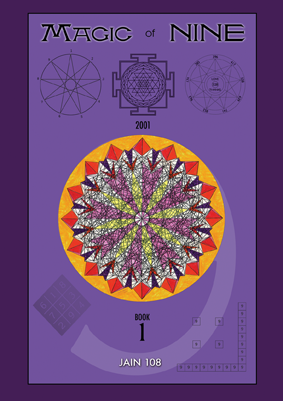 a – 1st Old Front Cover: image of mandala of the Magic Square of 9×9 (rotated upon itself 8 times) all hand drawn! 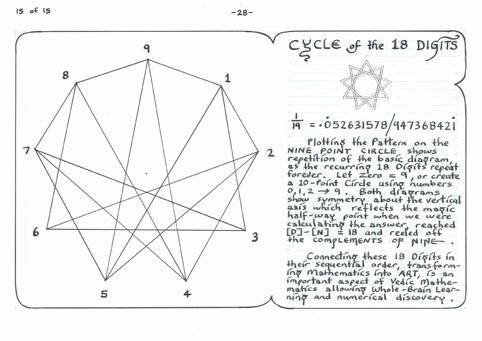 showing a Cycle of 18 Digits. 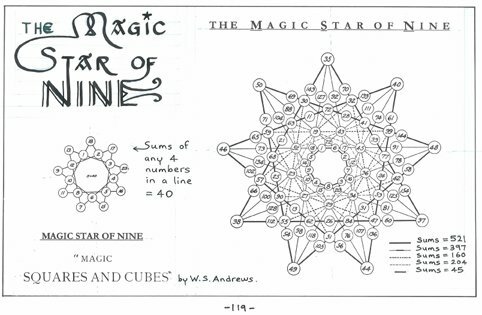 We are seeing that all fractions have hidden symmetry which the western mathematics does not show, and underlying this symmetry is the magic of 9ness. d – (p36 of 159) Special Division By 9. An elegant swift one line answer when dividing by 9.
f – (p59 of 159) Finger Computation of the 9 Times Table gives the young student a tactile relationship with numbers, using their fingers or digits to solve Multiplications. This method of Magic Fingers saves the young student 2 years of rote learning at school. 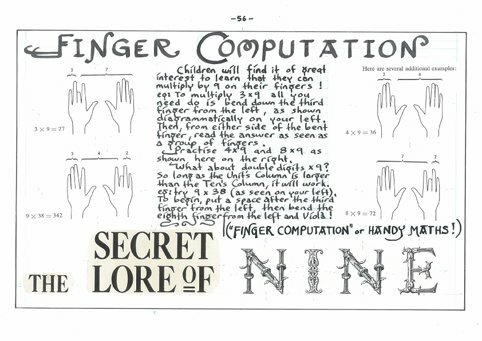 The title “Magic Fingers” was coined by me, and I popularized this lost method from 100 years ago, into the main modern curriculum. 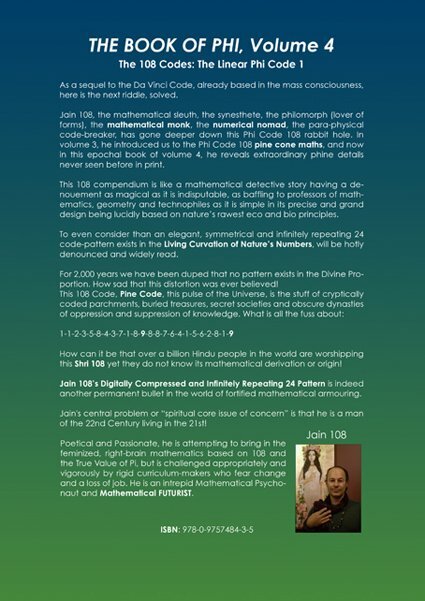 The decimalization of 1/89 has a remarkable cyclic answer, have a look in the book to discover this. Its a mathematical gem. The circular motif is the sunflower floret drawn on a computer showing the counter rotating fields of 21:34. 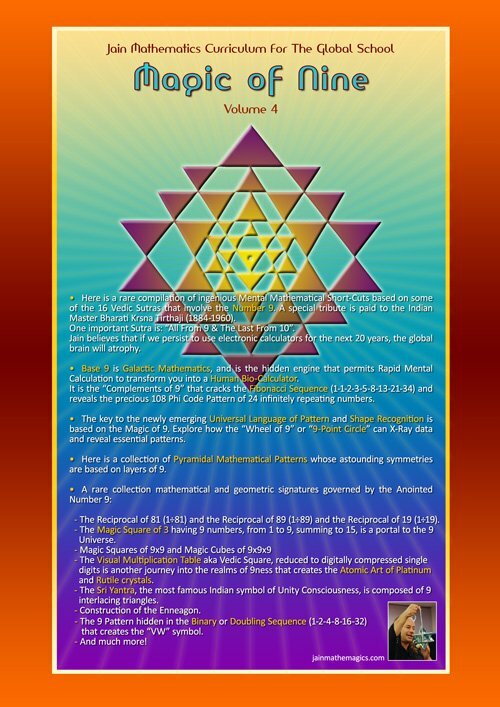 A highly psycho-active yantra and One of the key Laws of Nature. 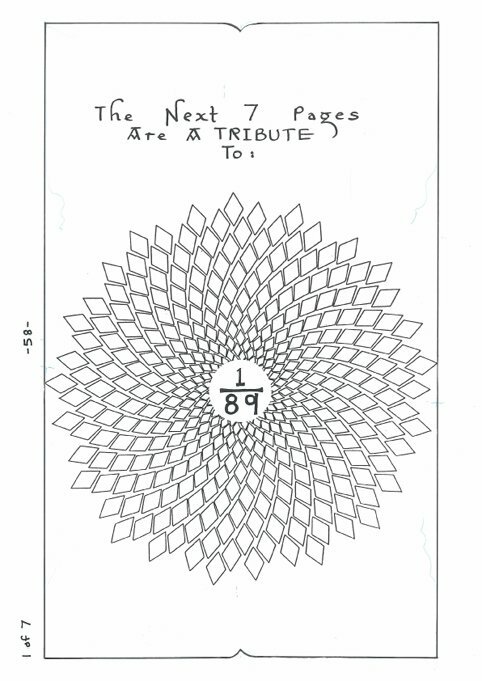 The symbolism of 9ness is hidden in this mystery of the sunflower or Divine Proportion, but it explained in my many books on Phi how 9 is the Galactic Base and the secret to the 1098 Pattern hidden in the sunflower vortex mathematics. h – (p91 of 159) Construction of the Enneagon or 9 sided polygon, using compass and straight edge only. Notice how I have attributed numbers to each of the ten fingers, but using only numbers from “0 to 9”. Look carefully at the opposing pairs of similar fingers and you will see that they are all Pairs of 9!